Rohet Ghar, was a wonderful experience. In so many of these converted Forts and Palaces there is no interaction with the family that owns them. Rohet was different - the family was very friendly. The Thacker greeted us in the morning in his riding gear as he prepared to ride through his villages. The Ghar (house) is famous for its horses (in fact the horse is the emblem of the Thakur of Rohet). The last image we have of him is riding off on his spirited horse down the lane. This is a must place to stay. 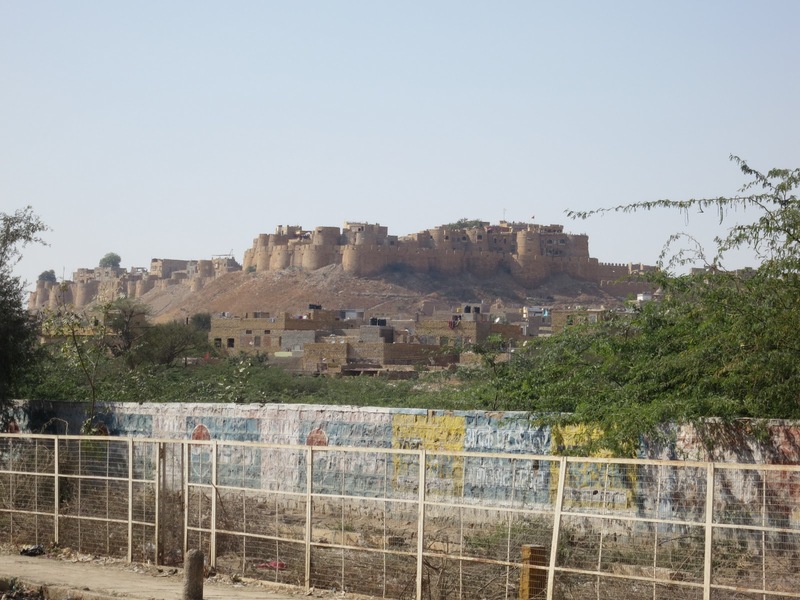 We then started our 5 hour drive to Jaisalmer. Jailalmer is near the Pakistan border and we past long military convoys, with lots of artillery. We assume that war has not broken out. Jaisalmer is the last inhabited fort in Asia. It is enormous and looks like a medieval castle. To get to it you drive across the Thar desert. The desert is famous as the place the Indians first tested their atomic bomb. Nothing seemed to be glowing in the dark as we drove by. 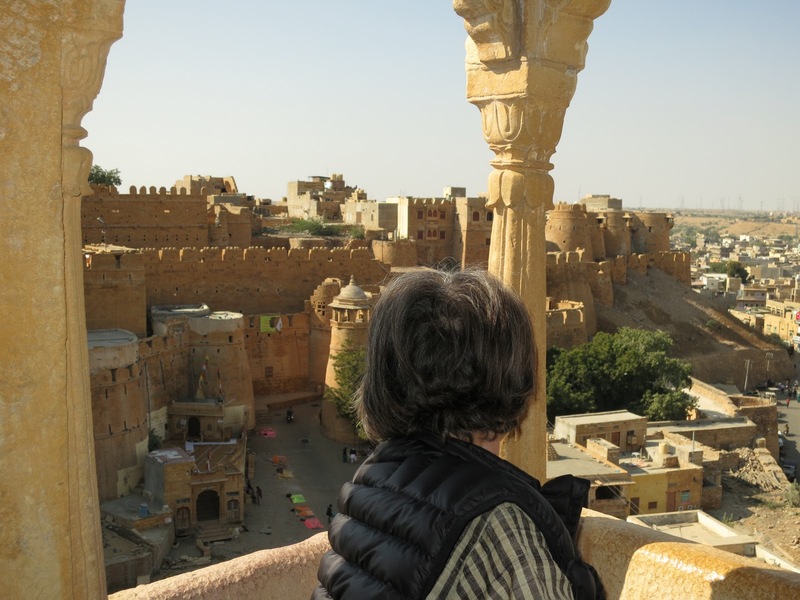 The Jaisalmer Fort (think castle) is located on high hill or low mountain strategically overlooking the desert. It is huge and in perfect shape for an old castle. It is jammed packed with stores, stalls, cows, dogs, people and vendors of all stripes. It is like stepping back into the middle ages. Cars can’t drive down the very narrow streets and tuck-tucks zip in and out, tooting their horns, darting down through the very narrow gates to the fort. Our suite is the most luxurious place to stay in the entire Fort. It has an amazing balcony that hangs over the walls of the fort where we shared a bottle of wine. 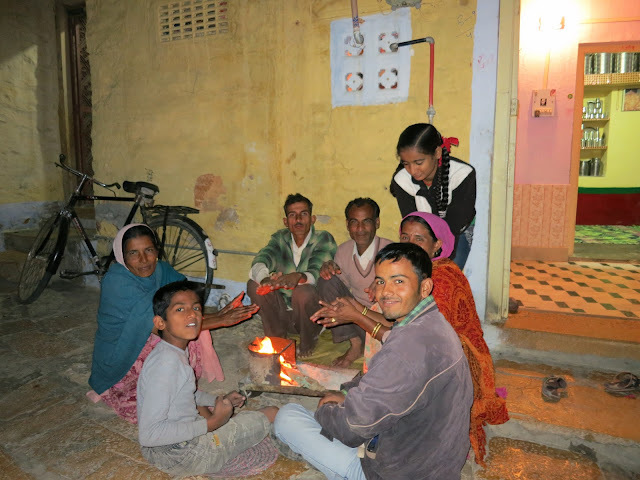 Although the place is wonderful, there is no power from 6:00am to 8:30am and no hot water during that time. That is just the way it is in this part of India. We walked around the fort, then went to dinner. There is a couple from Italy that we have become friendly with, and they are on the same route as we are, so we have met them several times. We went to the best restaurant in Jaisalmer and they were sitting next to us. 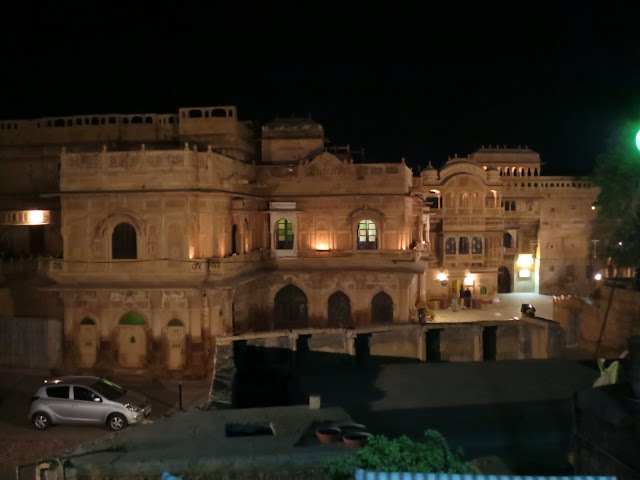 It was a rooftop outdoor restaurant overlooking some a beautifully designed old part of the fort. The texture of the walls was of an intricate design. 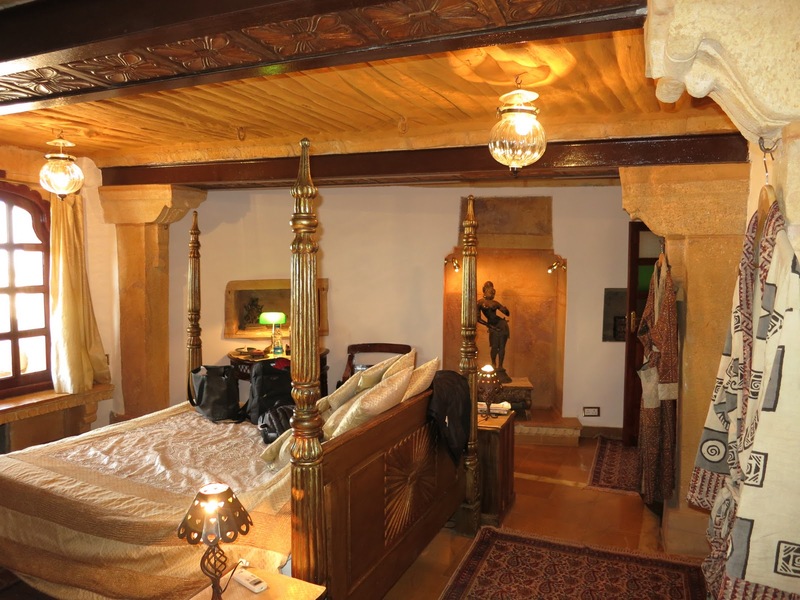 Everything here is made of yellow sandstone giving the fort its golden hue. Dinner was once again vegetarian, by choice: they prepare the vegetables in many ways, and we chose Rajasthani cooking which uses lots of tomatoes. It was excellent. We took a tuck-tuck back to the hotel and ran into an India wedding. 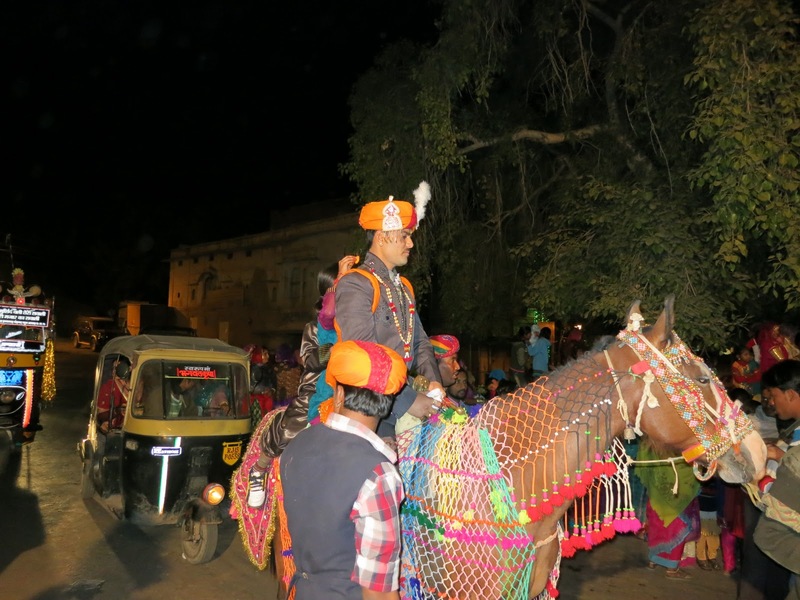 It was a typically noisy affair with music being blasted, the groom on a white horse, fireworks being shot off and crowds dancing behind the groom as they wound their way thru the streets. We stopped the tuck-tuck got out and enjoyed the procession. Tomorrow we meet our guide and will find out the truth and legends of the famous place.